This histrionic family drama must have looked good on paper to attract such a big-name cast, but on the screen it comes off as glib, rushed, and underdeveloped. A successful romance novelist (Ryan Reynolds, wearing a beard and glasses to look serious) comes home to visit his cruel father (Willem Dafoe) and gentle mother (Julia Roberts), but mom is killed in a car crash after dad swerves to avoid a child in the road. Writer-director Dennis Lee, making his feature debut, bounces between past and present, fielding so many characters and subplots that the central tragedy is too crowded to be genuinely felt (his muddled handling of the accident doesn't help either—I couldn't figure out for some time who'd actually died). There are numerous scenes of people running through tall grass and climbing out second-floor windows to commiserate with each other on the roof, indicating great yearning and melancholy. With Emily Watson, Carrie-Anne Moss, Hayden Panetierre, and Ioan Gruffudd. 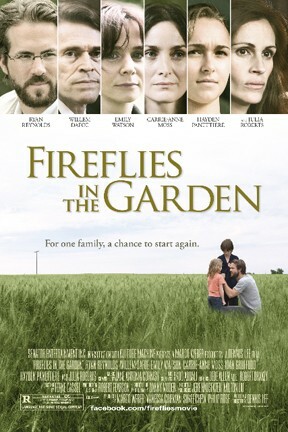 Fireflies in the Garden is not showing in any theaters in the area.